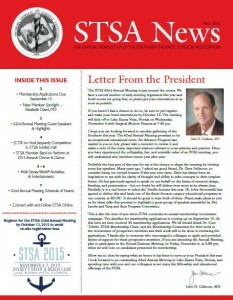 The Fall 2015 issue of STSA News was published on September 10, 2015. The Fall 2015 issue of STSA News is now available. Details about STSA 62nd Annual Meeting invited speakers and educational and social activities. View additional updates from STSA and past issues of STSA News at www.stsa.org/whats-new. Please contact Megan Drumm with questions or suggestions regarding STSA News at mdrumm@stsa.org.